It's that time of year again: The Arizona Game and Fish Department is looking for new homes for its population of captive desert tortoises. In a video posted to Facebook this month, the department said its wildlife center is "full up on tortoises." Every year, the agency adopts captive tortoises that cannot be released back into the wild. Doing so could introduce diseases in the wild population, Game and Fish says. If you're a permanent Arizona resident and are looking for a new pet, desert tortoises are easier to care for than you might think. You'll need an area of your yard that includes a shelter where the tortoise can hibernate during the winter months, and you'll need to keep food, ideally native plants, available for it to eat. Perhaps most importantly, you'll need to commit to the reptile for the long haul, including making a plan for what happens to it after you die. 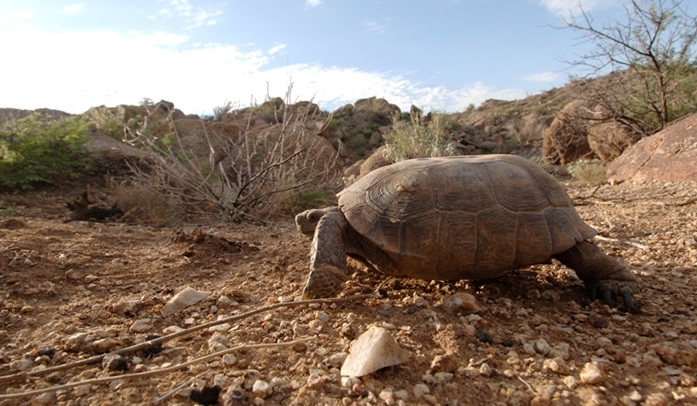 Desert tortoises can live for 100 years or longer, Game and Fish says. As a reminder, it's illegal to take desert tortoises from the wild. For more information on tortoise adoption, visit the department's website.